Love the convenience of online pokies but don’t want to be tied to a laptop or desktop computer? Not to worry – mobile pokies are now incredibly popular, with the top-rated casinos on the Web now offering downloadable apps and instant-play mobile sites for portable real money pokies you can play anywhere you can secure an Internet connection. We cover the best pokies apps and the games available for mobile play. This guide is for international players only, as online gambling and pokies play is currently prohibited in Australia as of September 2017 due to new gambling laws set forth by the amended Interactive Gambling Act. Despite a majority of all leading online slots sites offering a mobile platform for play on the go, only very few online casinos offer a downloadable pokies app. Most vendors these days prioritise instant-play games, which is where players can access games directly over their mobile Web browsers without having to worry about downloading any software. The widespread use of Flash and HTML5 software on smartphones and tablets means downloading a native casino app is no longer necessary to play portable pokies, although there are still some options for players who prefer to play using an app platform. 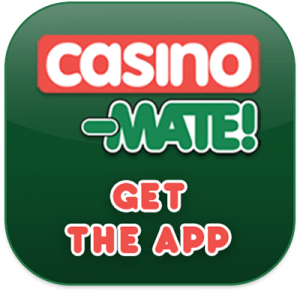 Casino-Mate is our top rated online casino, offering multiple ways for players to enjoy real money pokies including via the instant-play desktop, downloadable desktop software, browser based mobile play and best of all, a downloadable native app. The Casino-Mate app is available for iOS and Android users, allowing one-tap access to a range of Microgaming’s most popular pokies, including Dragonz, Lost Vegas, Thunderstruck II, Bikini Party, Mega Moolah, Major Millions and Avalon. A majority of the latest Microgaming pokies are now optimised for mobile play and added to the Casino-Mate app, so you never have to wait long for a new game to appear. Like the full desktop site, in addition to the pokies the Casino-Mate app offers a range of table games and video poker for mobile play. Play pokies using the Casino-Mate app to get up to $1400 in welcome bonuses plus 30 free spins to use on selected games. While not all of our recommended casinos offer a downloadable native app, they all offer an instant-play mobile site, where pokies can be played directly over the Web browser of any data enabled smartphone or tablet. Don’t be put off of playing at these mobile sites just because they don’t offer an app – the invention of Web apps makes downloading an app a thing of the past. Creating a Web app is easy. Just load the mobile casino of your choice over your standard mobile browser and then bring up the in-browser settings for your device. Select the ‘add to home screen’ option and an icon will be sent to your mobile desktop for instant tap access just like it would if you were downloading a native app. You’ll get access to all the same features as a downloadable app, without having to take up any space on your hard-drive or waste any of your precious data allowance. All Slots is powered exclusively by Microgaming, offering a collection of Microgaming’s most popular pokies for mobile play. Creating your own All Slots Web app will give you instant access to such popular slot titles as Game of Thrones, Mega Moolah, Bridesmaids, Karaoke Party, Win Sum Dim Sum and many more. All Slots also accepts multiply currencies for deposits via a wide range of payment options, including Visa, MasterCard, Neteller, Skrill, Paysafecard, ecoPayz and more. Jackpot City Casino is one of our favourite online casinos to play mobile pokies, offering a great platform whether you’re using an iPhone, iPad, Samsung, Windows Phone, Blackberry or any other smartphone or tablet model. Jackpot City mobile offers pokies from Microgaming, with games that have been flawlessly optimised for real money play on the small screen. Like All Slots and Casino-Mate, 7 Sultans is powered exclusively by Microgaming, so you’ll find many of the same mobile pokies available at each of these sites. The 7 Sultans mobile platform is perhaps the most user friendly of the three, offering nice big icons that make it easy to scroll through the pokies catalogue to find the game you’re looking for. If you’re looking for the best mobile casino to create a Web app for Microgaming pokies, 7-Sultans makes a solid choice. Creating a Web app at G’day Casino will give you access to a huge range of online pokies from some of the best game studios, including NetEnt, Leander, Quickspin and Blueprint. You’ll also find some progressive jackpot pokies at G’day that you won’t find at any of our other recommended pokies sites, like Genie Jackpot, Super Spinner Jungle Jackpots and Super Diamond Deluxe. G’day also makes it easy to create a Web app, as it will prompt you to do so when opening the mobile site over your browser for the first time. If you’re familiar with playing pokies at a desktop casino, making the transition to playing on your mobile is a breeze. Mobile games have been optimised to retain the same high quality graphics and animation, as well as offer all the same bonus features, with games simply shrunken down to fit the smaller touch screen of a smartphone or tablet. The major difference between desktop and mobile pokies is that the selection of mobile games available isn’t as extensive, as only the most popular games have been optimised for mobile play. As more players are turning to their mobiles to place real money bets on the pokies, more and more games are becoming mobile-friendly. Make sure you have a solid Wi-Fi, 3G or 4G connection and are employing extra safety measures like using a VPN if playing over an unsecured, shared network. Choose one of our top-rated mobile pokies sites discussed above to either play at directly over your mobile Web browser, download the native casino app or create your own Web pokies app. Sign up for an account and make a deposit in your local currency using a trusted payment method. Enjoy the ease of your touch screen to scroll through the pokies on offer, sample games for free in practice mode or dive right in and tap the betting options at the bottom of the reels to set the size of your bet and start playing for real money. Download the Casino-Mate native app for iOS and Android to play real money pokies on the go from your smartphone or tablet, and receive up to $1400 in welcome bonuses plus 30 free spins.